AMES, Iowa —A new effort to boost federal investment in agricultural research launched today in Washington, D.C., bringing together Iowa State University with 15 other public and private universities. Schulte Moore participated in FedByScience briefings this week for Senate and House of Representatives staff. The effort tells stories in which scientific discoveries and innovations have improved the way food is produced and distributed. FedByScience highlights the work of Schulte Moore and others. 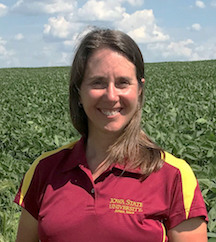 Schulte Moore and her colleagues, supported by USDA grants and other funding sources, examined a set of problems confronting corn and soybean farmers—soil and nutrient retention, especially during rainstorms—and engineered an improbable solution: interspersing strips of native prairie vegetation throughout the crop rows. Her team estimated that the prairie strips solution could be used on 9.6 million acres of cropland in Iowa and a large portion of the 170 million acres under similar management in the United States. “Access to safe, nutritious food and a healthy environment is a fundamental human right. The need for healthy food will only grow as we look to the future. There is no issue of greater importance for our experts in the agricultural and food sciences and few more deserving of federal support” said Kathryn Boor, PhD, FedByScience co-chair and The Ronald P. Lynch Dean of Cornell University’s College of Agriculture and Life Sciences. FedByScience is a collaborative initiative among universities to raise the visibility of the value of federal investment in food and agricultural research. FedByScience’s online collection of success stories highlights cutting-edge science that connect to the concerns of everyday Americans. Iowa State University’s agricultural programs are ranked in the top 4 percent worldwide. The Agriculture Experiment Station, administered by the College of Agriculture and Life Sciences, is Iowa’s only public agricultural research program and has served the state for 130 years. Over the last 5 years, scientists supported by the Agriculture Experiment Station successfully brought in more than $270 million in external funding. Agricultural scientists at Iowa State generate innovations, technologies, and solutions to immediate needs in food security, human health, economic development and environmental stewardship. Science-based information reaches every county in Iowa through ISU Extension and Outreach and research and research and demonstration farms guided by local stakeholders. The college’s 27 undergraduate majors prepare students for careers spanning the study of food, environment, energy, climate, nutrition and science and technology. The college’s current placement rate for recent graduates is 99.2 percent. The SoAR Foundation leads a non-partisan coalition representing more than 6 million farming families, 100,000 scientists, hundreds of colleges and universities as well as consumers, veterinarians, and others. For more information, please visit www.supportagresearch.org.